Sec. Florencio Abad and FNF's Dr. Ronald Meinardus share a joyful moment. FEF fellow Ernest Leung is seen at the back. 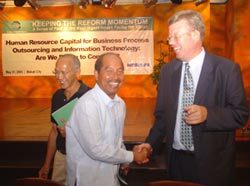 In the face of what has been termed the “call center boom” in the Philippines, the Foundation for Economic Freedom (FEF) in cooperation with the Friedrich Naumann Foundation (FNF) held a public forum on May 31, 2005 in Makati City to analyze the competitiveness of the Philippines in this growing international business. The president and CEO of C-Cubed Services Mr. Jose Xavier Gonzales set the tone with a presentation from an industry practitioner’s angle. “Call centers have been the big winners in this century,” he said adding that the Philippine government hoped to triple the employment in this industry to 300,000 in the next few years. Mr. Gonzales enumerated the problems confronting the outsourcing-business in this country, pointing to the lack of qualified applicants as the most serious constraint. The majority of the graduates leaving the educational system don’t meet the professional standards, said Mr. Gonzales, who quoted surveys showing that less than seven percent of Philippine high school students were proficient in the English language. In his opening remarks, FNF Resident Representative Dr. Ronald Meinardus gave an international perspective. He said in Europe four out of 10 firms have begun to relocate service operations abroad and this has caused massive unemployment in many countries. “For many European white collar workers this is a very negative result of globalization,” Dr. Meinardus said. At the same time, he concluded, outsourcing presents a chance for countries in the Southern hemisphere to attract new investments, job opportunities and development. You may view the powerpoint presentations of Secretary Abad and Mr. Gonzales by clicking here.